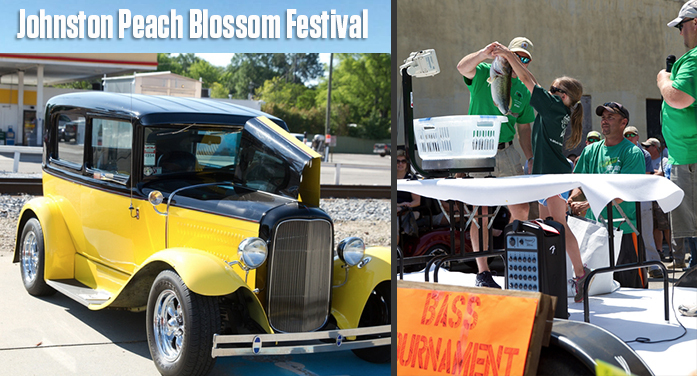 Two favorites – the Bass Fishing Tournament and Cruise In – are back this year at the Johnston, SC, Peach Blossom Festival, May 6, 2017. Anglers who want to show their fishing abilities can sign up for the 4th Annual Bass Fishing Tournament, part of the Johnston Peach Blossom Festival. The Tournament will be held May 6, the same day as the popular Festival. Check-in is at 6 a.m. that day with weigh-in held in downtown Johnston shortly after 2 p.m. The entry fee is $50 and is limited to 20 boats. This Tournament is pond fishing and for Jon Boats only. Payback is based on 20 boats on the five-fish limit Tournament, including a first place prize of $400, second prize of $240, and third prize of $160, along with $150 for the largest bass and $50 for the second largest. Entry deadline is May 4. For a complete list of rules and to enter, please call Cindy Sullivan, 803-275-2594. Now in its second year, the Festival will feature a Cruise In. The Cruise In will bring in many interesting and exciting vehicles for participants to enjoy. Some of the cars will be in the parade, which starts at 10 a.m., then the cars will be available for viewing through about 3 p.m. in the Johnston Municipal Parking Lot. Those who want more information or are interested in participating should contact Tony Friar, 803-640-2593, Debora Friar, 803-640-2595, or email dff01@aol.com. Food Concessions: Noah Peterson, (803) 480-0135, P.O. Box 282, Johnston, SC 29832, amossonsfh@yahoo.com. The Johnston Peach Blossom Festival Corporate Sponsors are Edgefield County Hospital, First Citizens Bank, IGA, J.W. Yonce and Sons, NAPA of Johnston/Edgefield, SCE&G, Northland Communications, and National Wild Turkey Federation. This year, the Festival has been upgraded. The Friday Night Dance will no longer be held. In its place, the funding is being used to pay for some invited entertainment, which will enhance the Saturday Festival. This year’s Johnston Peach Blossom Festival Entertainment Sponsors are Dr. Hugh Morgan Family Practice, Jim Satcher Motors, and Titan Farms.